1)Welcome to the platform of Indiacafe24.com. 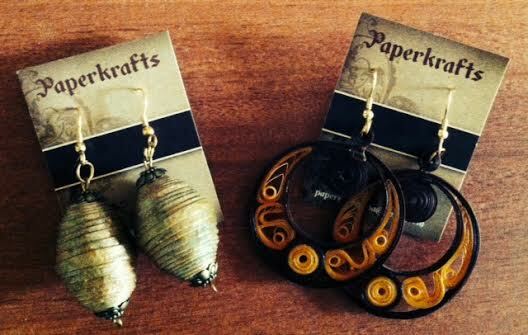 We are happy to have an exceptional talented entrepreneur making Jewellery out of paper. Kamakshi will insist you to give a brief about your background? Thank you for the encouraging words. 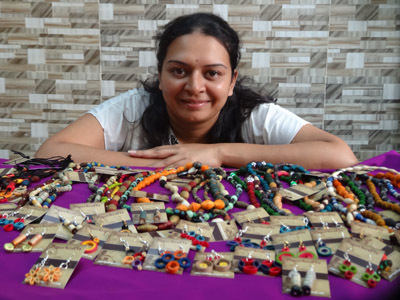 Indiacafe24 is a wonderful platform for small entrepreneurs like me to showcase our work. I am from a media background having worked with The Times of India Group, oHeraldo Goa and Big 92.7 fm primarily in circulation, advertising sales and events. I was also a nursery teacher at Eurokids pre school Chandigarh for a few years. I am from the beautiful state of Goa. I love monsoons, greenery and the sea. Give me an interesting book and I can laze around all day on the beach or in a park. 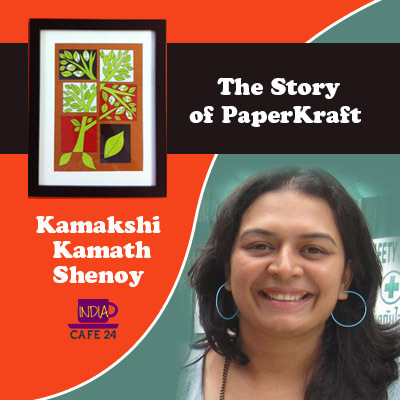 2) Share the story of making ” Paperkrafts”? Paperkrafts started as a hobby. After school my banker parents were transferred to Mumbai. Post my graduation in 2003 I did part time jobs and free lanced. In the meanwhile I took up a course in jewellery designing and at this course the visiting lecturer demonstrated a cute bead with paper. 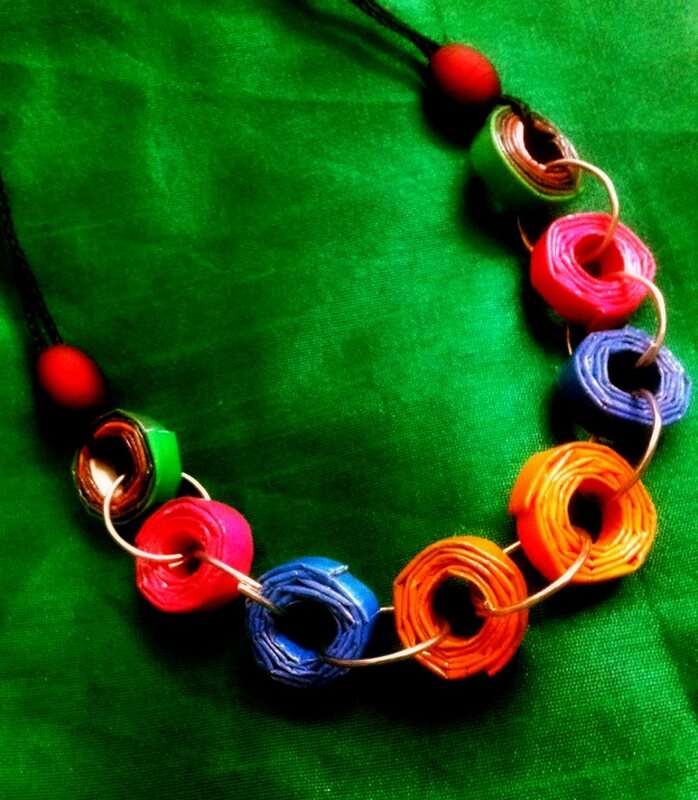 That was my first encounter with paper jewellery. We returned to Goa in 2005 and I got a break in Big FM radio as marketing manager and continued at their Chandigarh station till 2011. 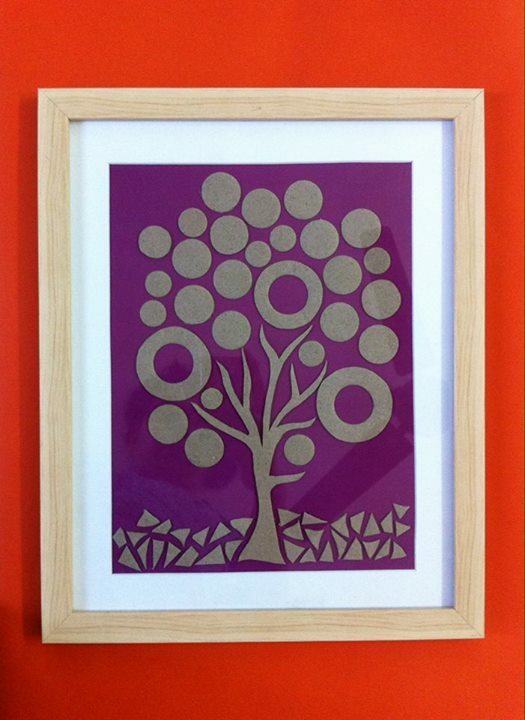 Hectic work schedules made sure that craftwork had taken a backseat. I left radio and joined Eurokids pre-school in Chandigarh. Craftwork was a part of the curriculum. Gradually my innovation came back to me when I made a bead necklace out of paper during a summer camp in 2012 and it was a sure hit. I moved back to Goa in 2013 from Chandigarh. I thought of taking up a job in advertising or media. but unfortunately most jobs offered were 6 day working (unlike my husband’s 5 work day). Also the packages were too less. 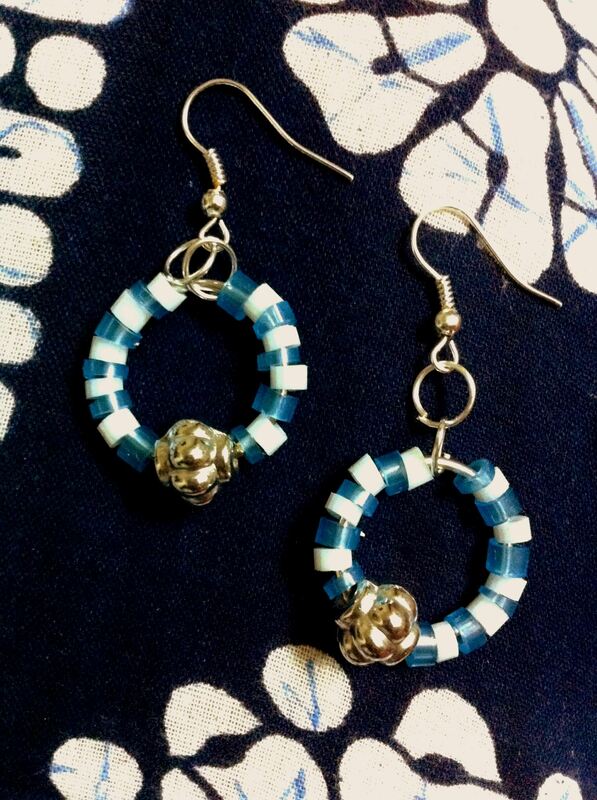 I used to make jewellery and post pictures on facebook. My friends loved them and motivated me to go for it! I decided to go commercial and full steam ahead making new designs and selling them. That’s the story of Paperkrafts. I started Paperkrafts to manage my personal life. That way I am professionally occupied, and spend enough time with friends and family. I have flexibility to work as per my convenience. 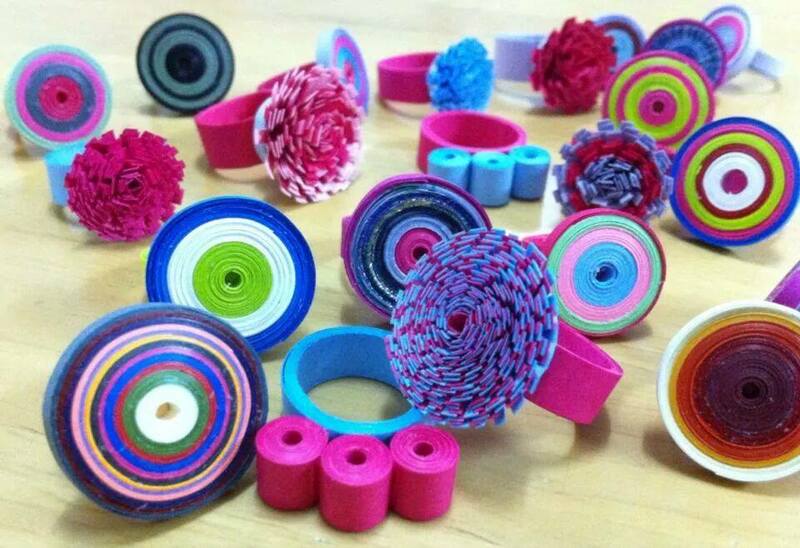 3)Where from you learned the art of making Paper Jewellery? As mentione earlier After college I took up a course in jewellery designing and at this course the visiting lecturer made a paper bead. Post that it was self learning and experimenting. 4) Who Inspired you to take this art form into profession? I would say the beautiful wedding cards inspired me. 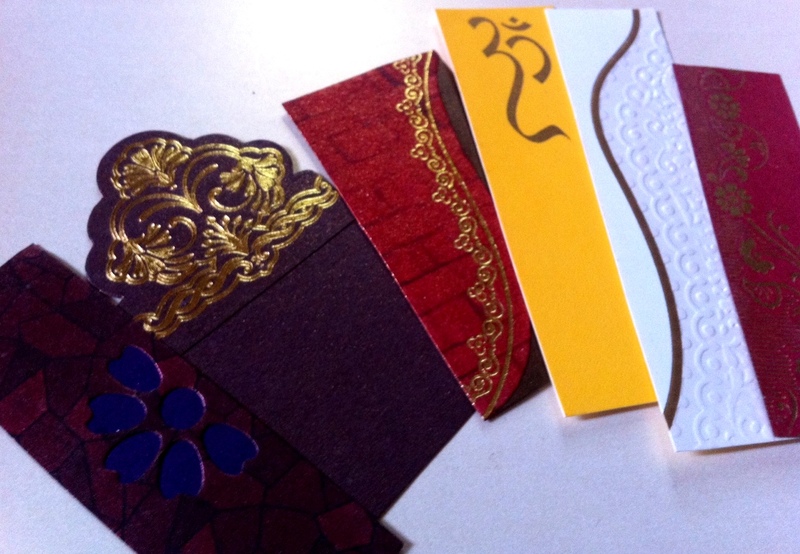 Beautiful, colorful and intricately designed wedding invitation cards are mostly thrown away after the wedding. What a waste of beautfil prints! I used to cut the Ganapati designs and keep the leftover pieces not knowing what to do with it. These beautiful designs inspired me to make something creative. Paperkrafts is about converting these beautiful cards, old magazines, fliers and other waste materials into wearable accessories and craft items. 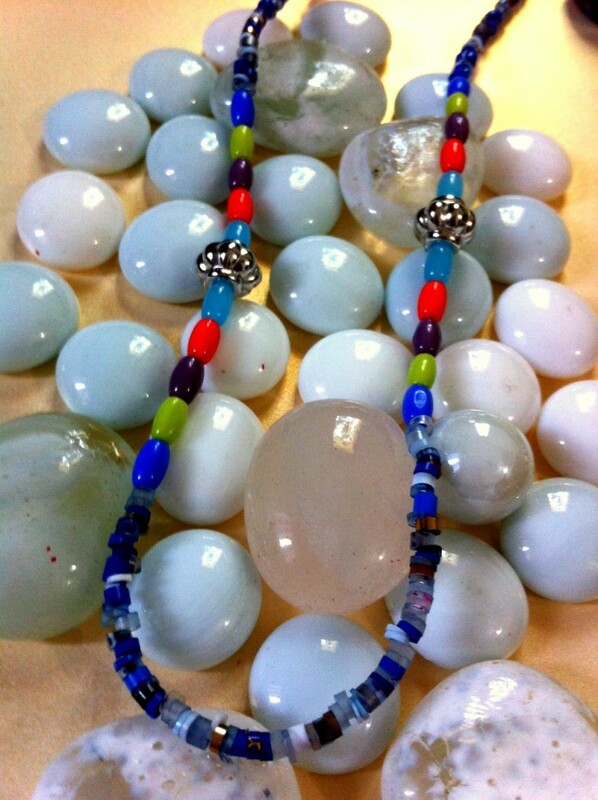 The designs are lightweight, colorful and fun to wear. These are perfect for people who prefer to avoid wearing heavyweight jewellery. 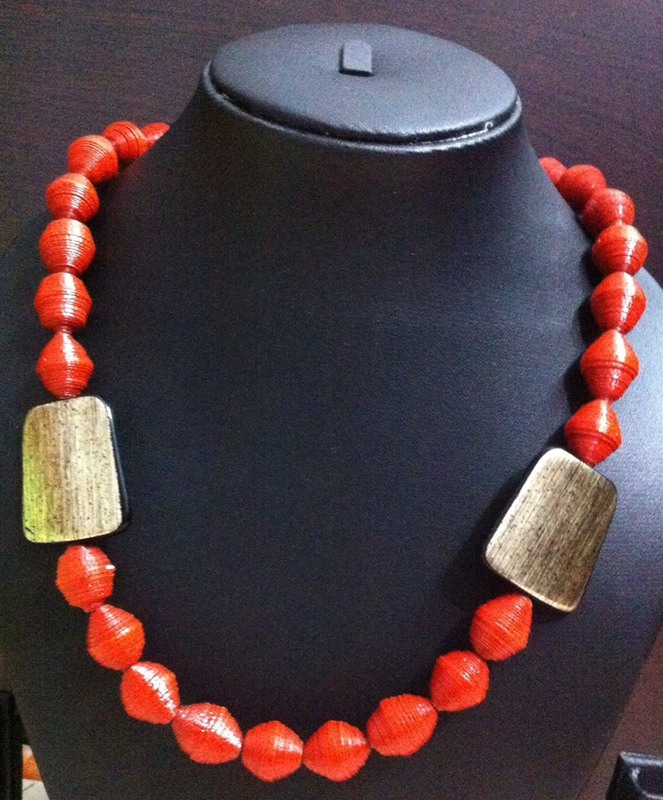 Most designs are inspired from nature – Flowers, leaves, insects, animals and basic shapes. My loving and ever supportive family inspires me. My biggest support are my dear parents, mother-in-law and sister-in-law. My entire family helps me with the invitation cards … uncles aunts, cousins, nieces …. The list is long. My husband is ever supportive with the investment and technology. He designed my website overnight! 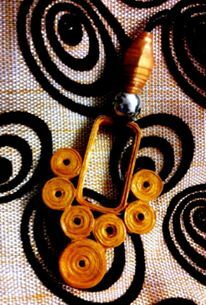 5)Where from you get the ideas of the designs or its just out of your imagination? Do you make any research to find the latest trend of designs in market? I go with the flow. Once I sit with materials there is no dearth of ideas. Whatever fancies me at that time. 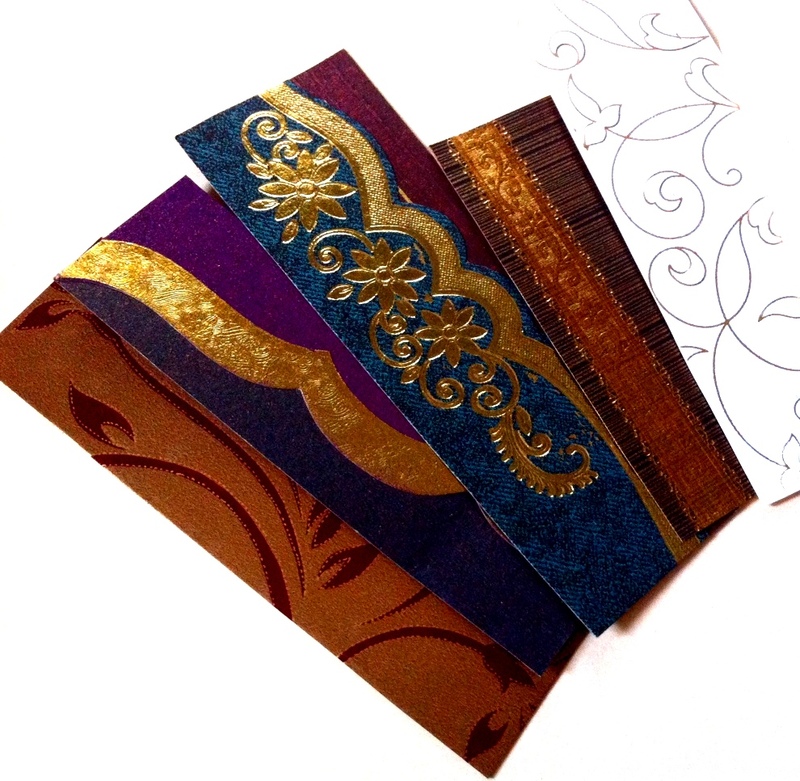 6) What materials apart from paper you are using in making of the products? I work on mainly paper and plastic waste. I am open to any kind of waste material. Recently I made two funky neckpieces with an old earphone! Most design are recycled. I use refills, earphones, pet bottles, broken glass and paper to make my products. 7) Do you accept request from client for customized designs? I haven’t yet but would love to! 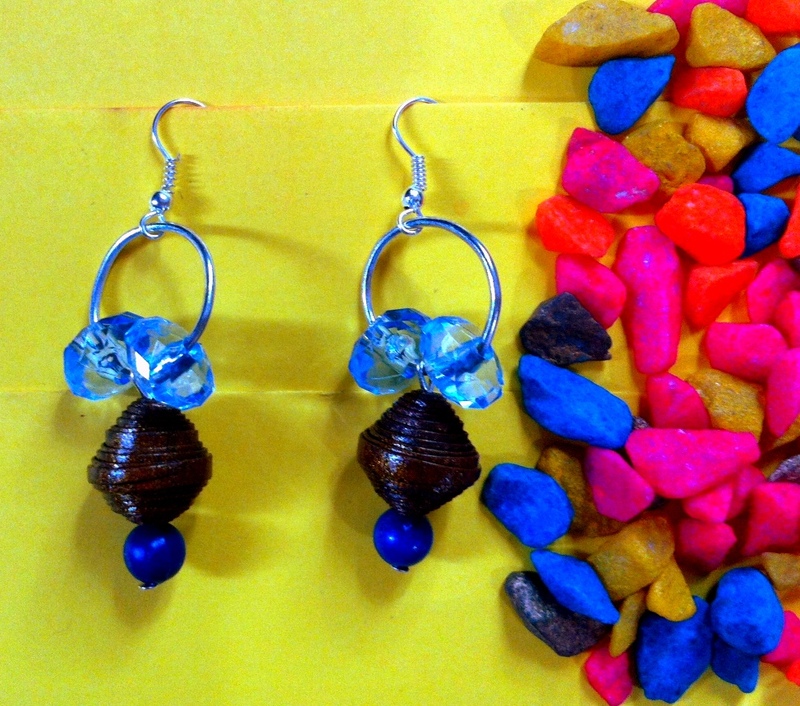 8) Are you making only Jewellery or some other products are also there in Your bag for clients? Apart from jeweler I make Coasters, Wall art stringers and bookmarks. Monsoons are off seasons in goa hence I use this time to experiment with new products. 9) How you actually reach to clients and help them know about your products? 10) Every project needs investments, how you manage to accumulate fund for investment in your project? The investment required is very less as I mainly use waste. the major investment is time and flair for marketing. The money I make is pumped back into the business for raw material. Else I borrow from my husband. 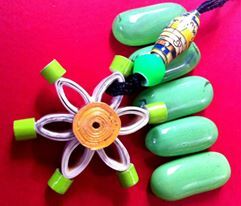 Since my products are made from waste, I receive a lot of encouragement. All the paper products are dipped in polish to make it water resistant, then dried in the sun for some time and washed in shampoo to check if it is well coated; it is my way of quality checking. The colours are bright, lightweight and funto wear. 12) Why you named your project as PaperKrafts, any specific reason? 13) What Plans you have in mind for expansion of Paperkrafts? I would love to see paprkrafts displayed at stores across india. I have been toying with the idea of online sales for a long time now. Hope to get it running soon. I also plan to start blogging about paperkrafts. Movies, photography, books and travelling. I am a movie buff I can watch upto 7 movies a day! 15) How to Contact you for placing orders? 16) Say something about the future of Indian women entrepreneurs? 17) What is so far your best creation as per you? 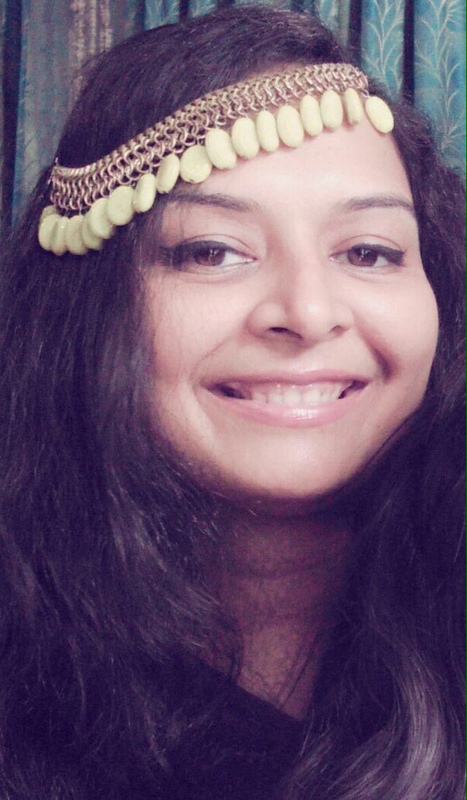 18) Define Kamakshi Shenoy – The woman entrepreneur from India? A confident and creative woman capable of achieving self-economic independence while keeping pace with her personal, family and social life. A go getter who loves to dream, and some day hopes to generate employment opportunities for others.